Top White House aide Rob Porter is just one of many members of the Trump administration accused of committing a violent act toward a woman. But he’s one of the few to lose his job over the allegations. Porter, President Donald Trump’s former staff secretary, announced he was resigning the post Wednesday, after his two ex-wives told the Daily Mail that he had physically and verbally abused them. He’s recently been romantically linked to Trump’s communications director Hope Hicks, and senior White House officials had known about the accusations against Porter for months and helped him secure plum duties anyway, unnamed sources told CNN. But while Porter has categorically denied the accusations, allegations of domestic abuse have trailed members of the Trump administration — including Trump himself — for decades. 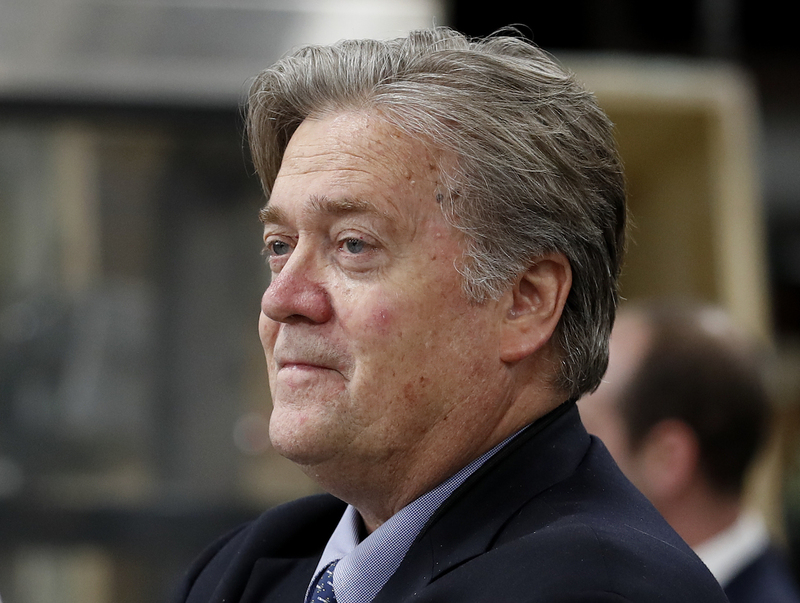 Former White House chief strategist Steve Bannon was charged with misdemeanor domestic violence, battery, and dissuading a witness in 1996 over an incident involving his then-wife, Politico reported shortly after Bannon joined the Trump campaign. Bannon’s ex-wife told police she’d started arguing with Bannon as he sat in his parked car and she stood beside it, according to a January 1996 police report. When he refused to give her a credit card to go shopping, Bannon’s ex-wife asked for a divorce and spat at him. Bannon then grabbed her wrist and neck to try to pull her into the car, over the door, until his wife struck back and escaped back into the house they shared with their infant twin daughters. Bannon was charged on Feb. 22, 1996, and pleaded not guilty on all charges in March, Politico reported. His then-wife failed to turn up for an August court date, leading the charges to be dismissed. She eventually filed for divorce in January 1997, according to records obtained by Politico. "The bottom line is he has a great relationship with the twins, he has a great relationship with the ex-wife, he still supports them," a spokesperson for Bannon told Politico. Andrew Puzder, Trump’s first choice to head the Department of Labor and a former fast-food executive, allegedly hit his ex-wife Lisa Feinstein on multiple occasions. The Riverfront Times, a St. Louis, Missouri alt-weekly, first detailed Feinstein’s claims back in 1989, when Puzder was just a local attorney. During the couple’s divorce proceedings, Feinstein filed court documents claiming that in May 1986, Puzder had "attacked me, choked me, threw me to the floor, hit me in the head pushed his knee into my chest twisted my arm and dragged me on the floor, threw me against a wall, tried to stop my call to 911 and kicked me in the back." In March 1990, Feinstein also donned a disguise to appear in “The Oprah Winfrey Show,” where she described the physical abuse she said she suffered at Puzder’s hands, Politico reported in January 2017. The episode, which was titled “High-Class Battered Women,” was later provided to senators reviewing Puzder’s nomination to the Trump administration. Still, the allegations — along with several questions about Puzder’s business practices — were enough to derail Puzder’s nomination as Labor Secretary. He withdrew his name in February. Trump’s ex-wife Ivana Trump accused Trump of abusing her on one occasion in her 1990 divorce deposition, according to the 1993 book Lost Tycoon: The Many Lives of Donald J. Trump. Following the publication of a Daily Beast story about the incident, Ivana Trump told CNN in a statement that the story was “totally without merit." While Trump's former campaign manager Corey Lewandowski, hasn't been accused of domestic violence, he's facing other, similar allegations. In March 2016, Florida police charged him with battery, after he pulled Breitbart reporter Michelle Fields out of Trump’s way at a rally. Fields told police Lewandowski’s yank had left her with a handprint of bruises on her arm, but Lewandowski said he never touched Fields. However, a Washington Post reporter who saw the incident also backed up Fields’ account, and footage of the incident later revealed Lewandowski had indeed grabbed the reporter as she alleged. The charge against Lewandowski was later dropped, since prosecutors felt they couldn’t prove beyond a reasonable doubt that Lewandowski had assaulted Fields. It wasn’t until months later that Lewandowski was fired from Trump campaign, apparently over concerns that he wasn’t up to the challenge of winning a general election.